In order to receive a free sample, first you must be logged into your Tedpella.com account. Sorry, you have already included your one time free sample in this order. If you would like to include this sample instead, first you will need to remove the previously picked sample. Sorry you have already received your one time free sample. Please continue with your online order. and mounting strips; sub-base provides rigidity and easier mounting. The Kimball Physics ES-423E (Extended Life) Lanthanum Hexaboride Cathode is a high performance, resistively heated, thermionic electron source. It is currently used in many electron optical systems: SEM's, TEM's, microprobes, electron lithography systems, etc. This superior LaB6 source gives a greater brightness (higher current density), lower energy spread (better resolution) and a longer lifetime than standard tungsten filaments. Lifetimes in excess of 6 months of continuous operation are regularly achieved in commercial SEM's and TEM's with suitable gun vacuum (10-7 torr or better). The standard emitter is a 15µm diameter <100> oriented single crystal surface mounted on the end of a single piece, stress-free, carbon heater rod, held in place by a carbon ferrule. The single piece carbon heater rod has a precision machined 100µm slot along the axis to direct the heating current; the result is no high temperature carrying high temperature joints. The design together with a high degree of symmetry keeps mechanical movements small which results in increased stability. The small physical size fits most Wehnelt cylinders with ease. Another advantage of the Kimball Physics LaB6 cathode is the reduced material loss which means less Wehnelt contamination; again this results in greater stability compared to other types of LaB6 cathodes. For further information see Technical Bulletins at bottom of page. 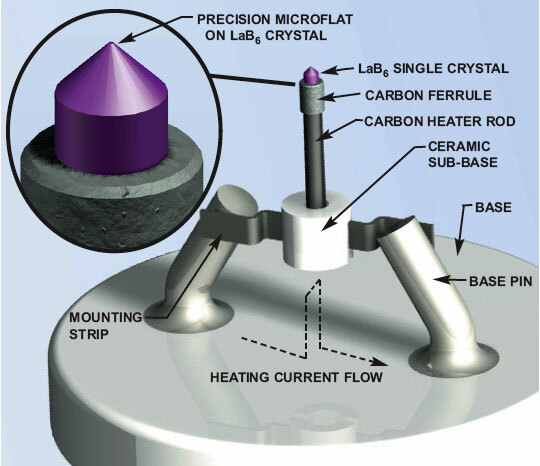 Unused LaB6 crystal mounted on carbon heater rod, and held in place by precision carbon ferrule; note roundness and smoothness of microflat. Copyright © Ted Pella, Inc., 1996-2019. All rights reserved. All trademarks are the property of their respective owners.